How do we celebrate #WorldWaterDay? We lift up the Bioneers doing the incredible and visionary work as we move towards a more sustainable, equitable future, where all recognize – Water is Life. Kandi Mossett (Mandan/Hidatsa/Arikara), Native Energy and Climate Campaign Organizer for the Indigenous Environmental Network (IEN), has emerged as a leading voice in the fight against environmental racism at Standing Rock and beyond. Kandi shares the powerful story of how her community drew on its cultural resilience to resist fracking in North Dakota, and how the re-assertion of tribal sovereignty, revitalization of language and restoration of traditional foodways can point the way to a just transition to a clean energy future for all of us. If you don’t think we’re at war, then you are sorely mistaken. We are on the frontlines. James Nestor, an author and journalist with a passion for extreme adventure who has written for Scientific American, National Public Radio and The New York Times, draws from his mind-boggling, multiple award-winning new book, DEEP: Freediving, Renegade Science, and What the Ocean Tells Us about Ourselves. 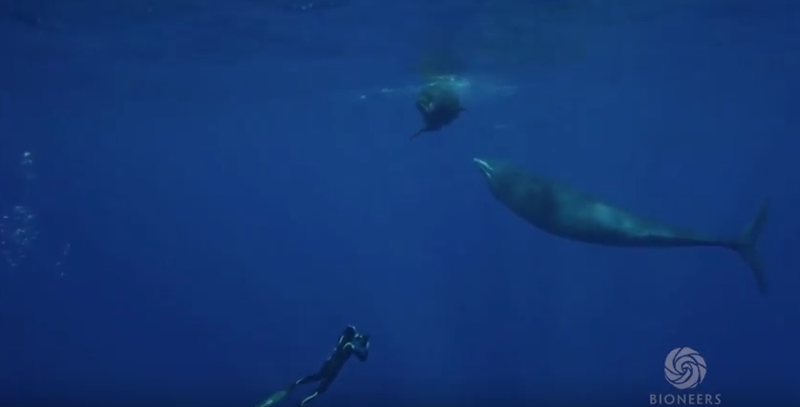 He describes how groups of athletes and scientists plumbed ocean depths, and researchers collaborating with engineers from Apple, Google and elsewhere worked to “crack” the cetacean language code and send back messages to these giant marine mammals – to make contact. Their weird and wondrous new discoveries might just redefine our understanding of the ocean, and of ourselves. There’s already non-human intelligent life in the universe, it’s here on our planet. It’s in our seas. Shannon Dosemagen describes how communities worldwide are being equipped to use new tools to redefine expertise and mobilize local intelligence to protect public health and ecosystems. As Co-Founder/President of the multiple award-winning New Orleans-based Public Laboratory for Open Technology and Science, she helped launch the Public Lab in response to the BP oil spill. Today it’s a groundbreaking platform and resource for citizen science environmental activism nationally and internationally. It’s crucial for us to create time and space for us to bring science back out into the public. Half of Americans cannot name one component of the water cycle upon which all life depends. Yet water is at the root of every human endeavor – from manufacturing to agriculture, energy production and waste management. No water, no life. Join master permaculture designers Darren J. Doherty and Brock Dolman for both practical and poetic ways to re-educate earthlings in soil and water literacy. Their practical vision for regenerating ecological integrity and social resiliency prepares us for the challenges of climate change and environmental stress. But above all, they illuminate inspired pathways for restoring nature and people in the re-enchantment of Earth. The water cycle and the life cycle are the same cycle: no water, no life. As fisherman, we are now climate farmers – restoring rather than depleting. Follow along with Bioneers as we dive deeper into this World Water Day revolution with our Facebook, Twitter, and Instagram.